Ten free and legal downloads or streams sure to strike the ear of the cash strapped college student. 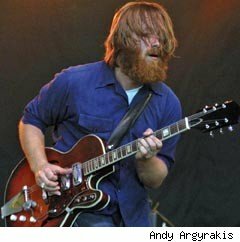 Akron, Ohio's favorite (and most famous) blues rockers (featuring Dan Auerbach, pictured) are back with the smoky new studio CD "Brothers." As has been the band's ongoing tradition, the collection's being unveiled with a cross continental tour that included a trip to AOL's headquarters to sample four live tracks and a sit-down chat as part of the ongoing Interface series. Be sure to catch the set it its entirety, but don't miss the smoldering "Everlasting Light." 2. Of Montreal: "Coquet Coquette"
Seeing Of Montreal in concert always proves outrageous, considering lead singer Kevin Barnes favors face paint and removes multiple layers of clothing. However, the band also has plenty of substance beyond its external expressions, including complex psychedelic pop arrangements with Baroque influences, all of which draw frequent comparisons to The Decemberists. 3. Paul Weller: "Wake Up the Nation"
Between fronting iconic punk outfit The Jam and the more soulful-minded Style Council, Paul Weller could've easily retired and collected royalty checks. But his solo career's proven increasingly prolific and fruitful, which in the case of this title cut from the brand new "Wake Up the Nation," returns to his gruff, rebellious rock roots. 4. Pull In Emergency: "Everything Is the Same"
This brand new band hails from London and has already inked an overseas deal with Mute (also the home of Depeche Mode and Erasure). Though its American debut track has elements of pure pop craftsmanship, don't expect a dance direction, but rather dusty indie rock grooves along the lines of The Strokes. 5. Nicholas Tremulis Orchestra: "Superhuman Love"
After a brief stint on Island Records, Nicholas Tremulis was one of the first artists to embrace the DIY mentality while forging a blues-inspired rock n' roll sound as heard throughout Chicago's South Side. The Windy City's pride showcases meaty licks and soulful pipes that make it clear why he's friends with the likes of Los Lobos, The Neville Brothers and Steve Earle. Being the guitarist and bass player for Paul McCartney's touring band might seem like the best job in the world, but it's also made the solo artist side of Brian Ray take a backseat of sorts, if only for his boss' enormous amount of notoriety. Nonetheless, there are plenty of his own jangly guitars chords, lyrics of nostalgia and nods to plenty of classic rock luminaries (including the Fab Four). 7. Bird Show Band: "Quintet Four"
This sample found under the drop down "discography" menu (under catalogue number AMI041) is flat-out bizarre at face value, but for those willing to embrace its unconventional mixture of jazz, progressive rock and synths, it's one of the more alluring projects to come from the Amish Records catalogue. Though the group is avant-garde at its most excessive, the European undertones provide a sense of warmth that make it less heady than most experimental projects of this nature. 8. Philip Bailey: "Cruel Time"
Since he's always on tour with Earth, Wind & Fire singing smashes like "September," "Shining Star" and "Let's Groove," Philip Bailey rarely has time to record a solo record. It's been eight years since he hit the studio outside the group, and as heard on this bonus track from the EP "Love Is Real," he's diving in a jazzier R&B direction than the band's funk-focused party. Flashback to the beginning of last year when Dinosaur Jr. was back on the reunion road and showing renewed relevance on the indie circuit after serving as alterative rock pioneers throughout the late 1980s through mid-90s. Four tunes find the band revving up its grungy guitars with irreverence in tact, alongside J Mascis' scruffy vocals of moody variations. For the past decade and a half, Ed Kowalczyk served as lead singer of Live, the grunge rockers who racked up sales of over twenty million albums across five chart topping singles and myriad of top ten tunes. Though the band's been stagnant since 2006, the leader branches out with the predictably titled "Alive," which bridges his original era with the present day. Also catch Kylie Minogue's new dance/pop project "Aphrodite," Juvenile's rap record "Beast Mode" and a comeback collection from Bret Michaels called "Custom Built."